Lady Gaga is famous for her unconventional outfits, concerts and music. She scored hits like ‘Born This Way’, ‘Bad Romance’, ‘Poker Face’ and others. Not all successfull pop artists are great singers. They don’t need to because a good voice is only a part of what you need as pop star. However, the better the voice, the better the performance will be. In this video Lady Gaga does a superb job! When watching this video one of the most striking things about Lady Gaga’s singing is how easy is sounds. In this duet with Tony Bennett, she sings The Lady is a Tramp. Her voice sounds free and completely natural, almost like speaking. 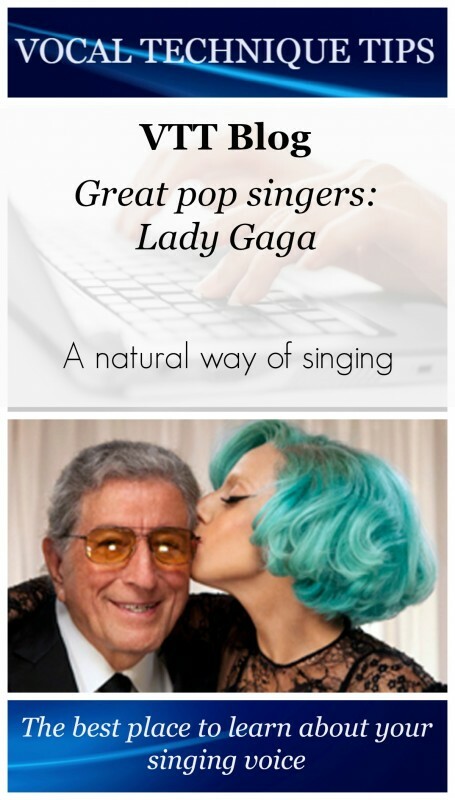 Lady Gaga allows her vocal folds to close and make ‘noise’ in a completely natural way. She is not altering the sound at all. Many singers make the mistake of judging the sound of their voice by listening while they sing. By doing that their hearing gives them false information about the sound and they will alter their sound. It becomes unnaturally warm, dark. Read the article What does your voice sound like? The paradox to learn more this subject.